The Organisation for the Prohibition of Chemical Weapons (OPCW) is implementing an agreement, reached by the US and Russia on 14 September, to destroy Syria's chemical weapons arsenal. The deal placed indefinitely on hold the prospect of US-led strikes on Syria as punishment for a deadly chemical weapons attack in Damascus on 21 August 2013. What does the US-Russia agreement say? Under the framework deal, the US and Russia asked the OPCW to approve procedures for Syria's chemical weapons programme to be destroyed, and for "stringent verification" that this has taken place. Damascus was given one week to submit "a comprehensive listing" of its chemical weapons agents, types of munitions and location and form of storage, production and research and development facilities. After Syria submitted its inventory, the OPCW team entered Syria on 1 October. The destruction of the arsenal began on 6 October, overseen by the OPCW. On 31 October, the international watchdog confirmed that Syria's declared equipment for producing, mixing and filling chemical weapons had been destroyed. In January, head of the joint mission Ahmet Uzumcu acknowledged there had been delays in transporting the chemicals along the main highway between Damascus and Homs. He said this was due to technical problems and the obvious difficulties of operating in a warzone. On 30 January, Defence Secretary Chuck Hagel said the US was "concerned" Syria was falling behind schedule in handing over its chemical weapons. In a statement to the OPCW, the US ambassador to the body, Robert Mikulak, said the US believes that only around 4% of the chemicals declared by the Syrian government have been removed. The "complete elimination of all chemical weapons material and equipment" must be completed by the first half of 2014. The US and Russia agree that Syria's chemical agents and precursor chemicals should be destroyed outside Syria if possible. But the framework says they could also be consolidated and destroyed inside Syria, possibly in coastal areas. What happens if Syria does not comply? 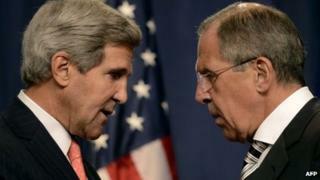 The US-Russian deal was enshrined in a UN Security Council resolution on 28 September. The text has two legally binding demands: that Syria abandon its weapons stockpile and that chemical weapons experts be given unfettered access. The US - backed by France and the UK - had pushed for a resolution carrying the threat of military action against Syrian President Bashar al-Assad's armed forces. Russia had opposed this. Although the resolution refers to Chapter VII of the UN Charter which allows the use of military force, a second resolution authorising such a move would be needed in the event of non-compliance by Damascus. On 14 September, the UN confirmed Syria had acceded to the Chemical Weapons Convention (CWC), which commits members to destroying their stockpiles. Seven days later, the OPCW confirmed it had received "the expected disclosure from the Syrian government regarding its chemical weapons programme". It declined to release details of what was in the declaration, which it says is privileged information. The US-Russia agreement says the two countries have "reached a shared assessment of the amount and type of chemical weapons involved". One US official said the agreed estimate was 1,000 tons of chemical weapons, including the blister agent, sulphur mustard, and sarin nerve agent. France has said it believes Syria has several hundreds of tonnes of sulphur mustard, several hundreds of tonnes of sarin, and several tens of tonnes of the more potent and persistent nerve agent, VX. The US has said the Syrian military has access to "thousands of munitions" that could be used to deliver chemical agents, including long- and short-range missiles, aerial bombs and artillery rockets. Have chemical weapons been used in Syria? While there have been many unconfirmed reports over the past six months, no-one disputes that chemical weapons were responsible for the deaths of hundreds of people in several towns of the Ghouta agricultural belt to the west and east of Damascus on 21 August. On 16 September, UN inspectors issued a report saying the environmental, chemical and medical samples they collected from the affected areas provided "clear and convincing evidence that surface-to-surface rockets containing the nerve agent sarin were used". The inspectors were not asked to ascertain who was behind the attack. On 30 August, the White House said it assessed "with high confidence" that the Syrian government was responsible. A French intelligence assessment published on 3 September said the attack "could not have been ordered and carried out by anyone but the Syrian government". However, President Bashar al-Assad blamed rebels for the deaths. He told the French newspaper Le Figaro on 2 September that Western powers had presented no evidence and that it would have been illogical for the Syrian army to use weapons of mass destruction in an area where its soldiers were present. Russia - Syria's main international ally - also believes the rebels are behind the attack. Foreign Minister Sergei Lavrov has said Moscow has "serious grounds" to believe the attack had been a provocation by rebel forces. Russia Deputy Foreign Minister Sergei Ryabkov has called the UN report "one-sided" and based upon "insufficient" information. How did the disarmament agreement come about? The 21 August attack triggered an international outcry. The US, UK and French governments swiftly called for punitive military action. However, momentum shifted when the UK parliament voted against military intervention and opposition began to emerge in the US Congress. The US-Russian initiative emerged on 9 September after Mr Kerry said - in an apparently off-hand remark - that the US might not carry out strikes if President Assad placed his entire stockpile of chemical weapons under international control within a week. Within hours, Mr Lavrov said Russia had urged the Syrians to agree to do just that and Syria's Foreign Minister Walid Muallem endorsed the idea. On 10 September, Mr Obama said he had put his plans for military action on hold. After three days of talks in Geneva, Mr Kerry and Mr Lavrov declared that they had agreed a framework to rid Syria of its chemical weapons. How have the Syrian government and opposition reacted? Syria's Minister for National Reconciliation, Ali Haidar, said the agreement represented a "victory". "On one hand, it helps the Syrians emerge from the crisis and on the other it has allowed for averting war against Syria," he told the Russian news agency, Ria Novosti. The National Coalition for Syrian Revolutionary and Opposition Forces said in a statement that it believed the initiative would embolden President Assad's government to "escalate its military offensive" across Syria. It warned that the Syrian government had a long record of breaking agreements and urged the UN Security Council to pass a resolution including the threat of Chapter VII measures. Gen Salim Idris, the head of the Supreme Military Council of the rebel Free Syrian Army denounced the agreement. "All of this initiative does not interest us. Russia is a partner with the regime in killing the Syrian people," he told reporters in Istanbul. "A crime against humanity has been committed, and there is not any mention of accountability."